Recently the Smoloskyp Publishing House has published the monograph-album Halyna Sevruk authored by Bohdan Mysiuha. The Day discusses Ukrainian history and ceramics, the art seeking to recreate it, in an interview with the artist Halyna SEVRUK. Halyna Sevruk’s ceramic pictures are a sample of people’s decorative art that recreates and depicts the pages of our history and culture. However, the artist does not regard herself an expert of people’s art because it was only recently that she began to study it. She grew up in a complicated time. The artist’s mother ran from the revolution to Uzbekistan, where she married to architect Sylvestr Sevruk. They gave birth to two daughters (Halyna was born in May 1929). Later the family moved to Kharkiv. It is significant that Halyna’s great grandfather, a famous architect Vasyl Hryhorovych-Barsky, one of the founders of Ukrainian baroque in architecture. His works include the Church of Saint Nicholas on the Bank and Fountain of Samson in Kyiv’s Podil. Halyna Sevruk graduated from the Kharkiv Institute of Arts. Then she worked at the Artistic Fund: made copies of pictures like Lenin in His Office. One day artist Halyna Zubchenko brought her to the Club of Creative Youth. Among its members was the flower of the then artistic and intellectual life, like Ivan Svitlychny, Opanas Zalyvakha, Alla Horska, Ivan Dziuba, etc. 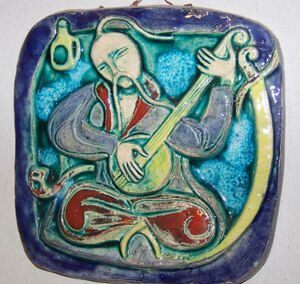 That was the turning point in Halyna’s creative work, and she began to create relief ceramic pictures. And she picked up the topics from the pages of our history. Was it then that you understood that despite your profession, painting was not quite your thing? Halyna Sevruk entered the Sixtiers society and learned the Ukrainian language and culture on her own. In 1968 she signed a letter in support of the repressed Ukrainian intellectuals, for which she was excluded from the Union of Artists. The artists of the same fate united and created so-called mobile schools. They resembled universities on wheels: together they traveled over Ukraine, taught drawing, arranged exhibits, and lectured. What did you remember most from your travel with mobile schools in the late 1960? How do you work with historical material? “I read much, work with the archives, talk to historians, I take a special interest in the history of ornaments. 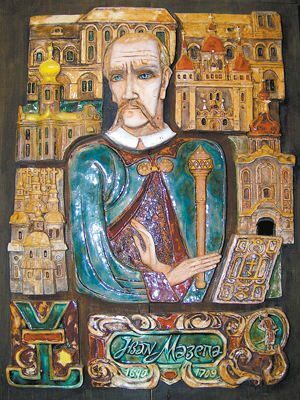 For example, the work Ivan Mazepa. It recreates historical details in costumes, a family coat of arms. The churches around Mazepa were built by him. “Presently I am reading Yurii Horlis-Horsky’s Kholodny Yar. The author worked very thoroughly with the archives. Hopefully, I will use it in my future works. What can’t art do without? Currently Halyna Sevruk’s works are preserved in the Museum of Kyiv’s History, National Museums of the History of Ukraine and Ukrainian Art, the Museum of Hetmanhood, Lesia Ukrainka and Mikhail Bulgakov.